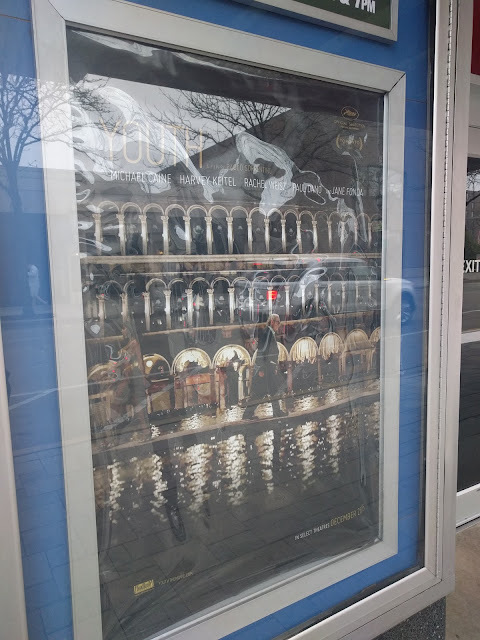 That photo above with all the terrible glare that comes from my morning walk to the train shows the movie poster for the Art @ the York Theatre monthly film 'Youth' staring Michael Caine, Harvey Keitel, Rachel Weisz - who, Nat can tell you - I have a little thing for. And Michael Caine? He's awesome, right? But, now that the guys on the Stern show are doing phony phone calls with someone who does his voice as "British Actor Michael Caine", I can't keep a straight face whenever I see/hear his name. The film is being shown a week from today: May 11th. 1 pm and 7 pm central. I continue to promote these showings because I think they're great for the community. Good on Classic Cinemas for continuing to push forward on the Art @ York series. YOUTH is about two longtime friends vacationing in the Swiss Alps. Oscar winning actor Michael Caine plays Fred, an acclaimed composer and conductor, who brings along his daughter (Rachel Weisz) and best friend Mick (Harvey Keitel), a renowned filmmaker. While Mick scrambles to finish the screenplay for what he imagines will be his last important film, Fred has no intention of resuming his musical career. The two men reflect on their past, each finding that some of the most important experiences can come later in life.